A beautiful 18ct white gold ring, claw set with three brilliant cut diamonds totalling 1ct. A timeless design that will last a lifetime, perfect as a gift or as a token of your true love when asking that all important question. 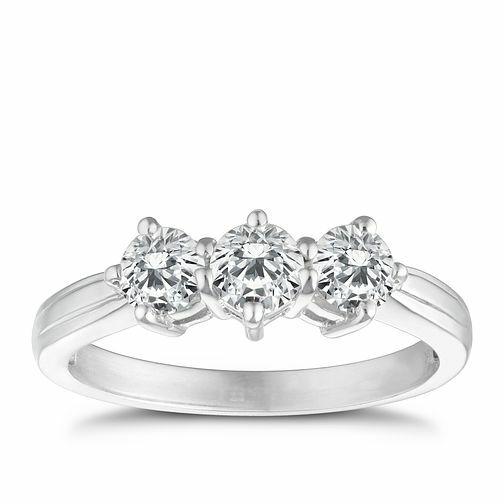 18ct white gold 1ct diamond three stone ring is rated 4.7 out of 5 by 3. Rated 5 out of 5 by Anonymous from Love this ring Had mine 6 years and still love it as much as when it was given to me. I've only just had it replatted for the first time by Ernest Jones and yet again brilliant service. Rated 5 out of 5 by Anonymous from beautiful ring I'm probably biased but this ring is beautiful, I wouldn't have chosen this type of ring at all, it was chosen for me and I'm so glad that it was. Even six months later it sparkles like new, people are always commenting on it, even complete strangers at till check outs! !